= Kyou no sensei boku demo ii ? = Would it be OK if I were the teacher for today? / Do you mind if I am your teacher for today’s lesson? Today’s guest teacher is ブンタ先生 ( = Bunta Sensei). He is a very friendly 2 year-old boy. Yukari met him on the street near her house and they became friends. After hearing about our site, he volunteered to be a guest teacher. He is fluent in Japanese so he will be a good teacher! Are we ready? = Minasan, hajimemashite. Bunta desu. Kyou, minna ni nihongo wo oshieru koto ga dekite ureshii desu. = Nice to meet you, everyone! I’m Bunta. It’s my pleasure to teach you all Japanese today. = Kyou wa dare ni nihongo wo naraitai desu ka? = Who would you want to learn Japanese from today? = Bunta sensei de iidesu. =I don’t mind if Bunta Sensei is the teacher. = Bunta sensei ga iidesu. = I want Bunta Sensei to teach us Japanese. I would feel a bit hurt because で ( = de) has a nuance of compromising so it sounds like I may not be the perfect teacher but there is no choice so you have to accept me as a teacher. using が ( = ga), I feel flattered because you choose me over everybody else to be your teacher. = Bunta sensei demo iidesu. When you express what you want, you use both ~がいい ( = ga ii) and ~でいい(=deii). While が ( = ga) shows a strong preference/desire, で ( = de) shows your feeling of compromising or gives a sense of looking down on someone/something. So you have to be very careful when to use them and which one to use. I know it is just one letter but it changes the nuance completely. = I want THIS ONE! = I will be fine even with this one. = Nani ga nomitai desuka? = I will be fine even with a beer. = Nani wo nomu? Mizu de ii? = What do you want to drink? Will (just) water be OK with you? = Un, mizu de iiyo. = Un, mizu demo iiyo. = Yeah, even just water is fine with me. = I want a Coke! Note: What to do / Which one to use…. 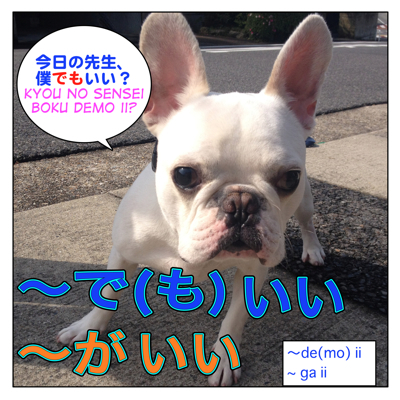 So で ( = de) or でも ( = demo) may offend someone’s feeling because it sounds compromising. But が ( = ga) expresses your desire straight forward, and remember that Japanese people sometimes prefer to avoid straightforward expressions. = Omizu (wo) onegai shimasu. = Then I’d like to have some water, please. = Sorede wa omizu (wo) itadakemasu ka? = Then, may I have some water please? Note : Though your Japanese teachers would probably frown on my teaching this, but the truth is we often omit particles in conversation. When you say を ( = wo) , an object marker, you ask for something, in this case a glass of water, a little bit more clearly. = Give me some water. When you want to express your preference in a strong way, you use がいい ( = ga ii) and when you make it sound softer you use でいい ( = de ii). Though as I said, when you answer using でいい ( = de ii) you are including a nuance of compromise and that may annoy the person who offered you something. = Yuushoku wa suteiki ga iina. = I wanna a steak for dinner. = Eh? Okane naino? Jaa, tori no karaage de (demo) iiyo. = What? You don’t have money? Then, fried chicken is just fine. = Madogawa no seki ga iidesu. = I prefer a window seat. = Moushiwake arimasen ga, madogawa no oseki wa mou ippai desu. = We are very sorry but all the window seats are already booked up. = Jaa tsuuro gawa no seki de iidesu. = Then, an aisle seat is fine. = Natsuyasumi, dokoni iku? Kaigai ni iku? =Where should we go for summer vacation? Shall we go abroad? = Kotoshi wa kokunai de iiyo. = Somewhere in Japan is just fine this year. = Watashi wa Italia ga ii! = I want to go to Italy! = Kyou wa tsukarete iru kara yuugohan wa konbini no onigiri de ii? = I am tired today so do you mind if we just to eat rice balls from the convenience store? = Ehh! Karee ga ii! = Oh no… I want CURRY!! = I love you, Bunta! = Hontou ni boku de(mo) iino? = Mochiron! Bunta ga iino! = I mean it! I like YOU, Bunta! = Biiru ja nakute mo iiyo. = It doesn’t have to be beer. = Sono hoteru de (wa) nakutemo ii desu. = It doesn’t have to be that hotel. = Mina wa Maggie sensei ga ii? = You prefer (to learn Japanese from) Maggie Sensei? = Thank you, Bunta sensei! = Bunta Sensei wa wakai onnanoko ga suki? = Do you prefer young girls, Bunta-Sensei? = Soretomo watashi no youna jukujo demo ii? = Or is a “mature” woman like me OK? = Bunta: “I would be OK even with you, Maggie Sensei. Hello Maggie-sensei. Thank you for a very informative lesson! I have come across this sentence when reading a manga, and I’m sure it’s pretty basic but I am not quite sure how to translate it…. I don’t understand the compromise theory in this case, because he is asking something pretty general. Is it right that Tanaka-san and Yamashita are “friends from University”? Yes, your translation is good. Tanaka-san and Yamashita-san are “friends from University”. Am I right? Is that right? /Is it right? / Am I right? The speaker is checking some fact or their assumption is right. So when you choose one particular thing. 見てるだけでいい = just watching is good enough. You don’t need to do anything./ You just need to watch it, that’s all. I will give you the gist. As for TV, it is easy because all you need to do is just to watch, you know. Doushite “dare NI Nihongo wo naraitai?’? This always confuses me. Itsumon mono energy koto wo komateiru. = Dare kara sono tokei wo moratta no? = (Lit) From whom did you receive the watch? = Who gave you the watch? = Dare ni sono tokei wo moratta no? = Chichi kara tokei wo moratta. = I received the watch from my father. = Chichi ni tokei wo moratta. ＝ Maggie sensei ni nihongo wo oshiete moratta. but 〜もいい(=mo ii) is more subtle than ~がいい(-ga ii) or 〜はいい(=wa ii) and more suggestive. = Tamani wa onsen ni iku no mo iidesune. = It is nice to go visit hot springs once in a while. = Kyouto ni iku no mo iidesune. = Visiting Kyoto would be nice,too. You’re the best Maggie Sensei.. please keep up the good work! But how does this differ from “nounがほしい” or the “たい” form of verbs? OK, let’s compare the following sentences. If Leelu wants to be a member of Team Maggie, please find the information here. About Us. ありがとう先生。とても便利な表現です。少し聞きたいことがあるんですけど。In English, we’d often answer a questions like ‘Where should we go for lunch’ with something like ‘anywhere is fine’. In Japanese, is it 「どこでもいいですよ」？Grammar ok? Politeness ok? Is the pattern usually どこ／どれ／どちら　＋　でもいい? Or just もいい？　Or either one? Can you add など to make it sound less specific? →Yes. We say that often in conversation. どちらでも結構です(= dochira demo kekkou desu) sounds more polite. Hi, Maggie Sensei! Another great lesson, but there’s another usage of いい　that I would like to ask about. What does it mean when は precedes いい？From what I understand, it can mean ‘It’s fine, don’t bother’. Would you mind elaborating? P.S. Is there a lesson concerning the usage of the casual 意向形動詞available? So いい means “good/nice, yes and no” depending on the context. = I love nature. / Nature is good. = Maggie sensei, kono okashi tabete mo ii desuka? = May I eat this snack, Maggie Sensei. ? Note : This いい means “Yes” . Now what confuses you is the following one. = Maggie Sensei kono okashi tabemasuka? = Do you want to eat this snack, Maggie Sensei? The polite way is : 結構です。= Kekkou desu. = No thank you. ☆This いいです means いらない（です）(= iranai (desu)) “No thank you” and saying “No” to someone’s offer. I will make a short lesson for you in near future. I might have made a mini lesson on Facebook but I will add it on the request list. =Layol, comment arigatou!! Hai ganbatte lesson tsuzukete ikimasune. Korekara mo yoroshiku!! OK, I saw the site and I agree. It is not natural to skip も here. Ex. 見せてもいいですよ。I don’t mind showing something to you./ I could show something to you. I’m very grateful for your help. This was the only part in 禁止／許可 that I had problems with. 1. Learn the language basics from the Internet. 2. Buy the best available books for the Japanese language proficiency test (up to N1). 4. Learn every day (no excuses) new words, new 漢字's, new expressions, new grammar forms; systematicity is the key. 5. Make notes. The most important grammar information you've read should be in one place. Unfortunately there are no perfect books. So every book, every website will bring you tons of new information. 6. When you reached the N2/N1 level then it's time to read Japanese school books, just like the Japanese do at school (ex. 日本語文型辞典) . Use 100% Japanese dictionaries like http://kotobank.jp/ No English allowed on this level. 7. Buy some Japanese novel books (written in Japanese) and the English version of it. Read them simultaneously. 8. Watch every day for few hours NHK or listen to Japanese Radio or just watch anime if you don't have access to NHK or jap. radio. 9. Stop thinking in your mother language, start thinking in Japanese! 10. Learning Japanese = FUN!!! – have the satisfaction that nothing's impossible. I am in the middle of my path to master Japanese. And Japanese is my forth language. WOOOOW!! I am VERY impressed! Thank you so much for sharing this valuable information. I bet many people can learn from this list. I like your learning attitude a lot. Not just setting the goal but you actually make a great effort. Haha, thank you for including my site in your list. I feel flattered. I totally agree with No.10. Let’s have lots of fun learning Japanese!